Acorn-fed pork ham, 50% Iberian, in envelopes of 125grs. 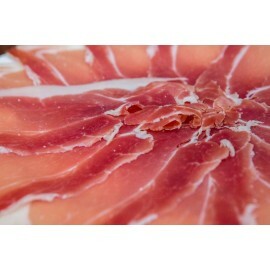 Acorn-fed pork ham, 50% Iberian, cut by machine. It comes in a box of twenty 125gr envelopes. vacuum packed. Store at a temperature between 0 and 8º C. Cured product. It can be consumed directly, it does not need cooking, it is recommended to open the container 10 minutes before consumption. Consume at room temperature. Cured pork ham in cellar in envelopes of 150 gr. Pork shoulder cured in cellar, in envelopes of 150grs. Paleta de Bellota ibérica 50% Raza Ibérica sobre de 125gr. 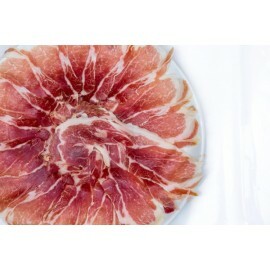 Plate of cebo iberian pork ham cut by knife. 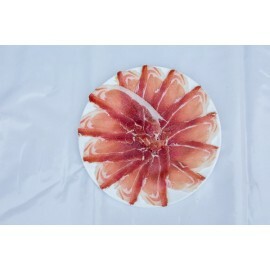 Plate of pork ham of "cebo", 100% Iberian, cut by knife. 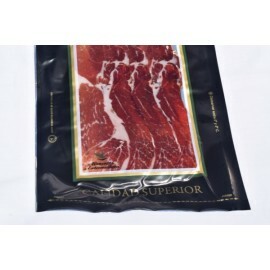 Cebo pork ham, 50% Iberian, in envelopes of 125grs.